I really enjoy Asian food and feel like I never get enough of it because my husband really isn't into it much. When we go out to eat in, I pretty much need to make sure there is ham fried rice on the menu, or he will be all grumpy. It limits a lot where we get to go eat if it's just the two of us, and I can tell you, it's almost never Asian food. He will eat sushi so at least there is that. But I just want to incorporate those amazing flavors more into out dinners so I decided that whatever I'm making it better not have noodles and it better have lots of meat. I am still on a Teriyaki kick since I made my own sauce for Teriyaki noodles so I decided on chicken kebabs. 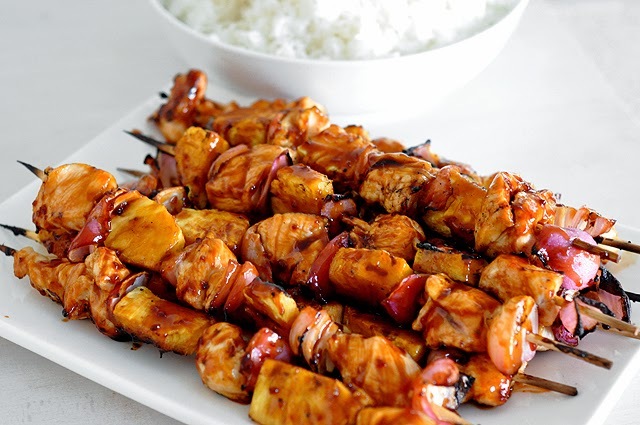 And what goes better with Teriyaki than pineapple and onions? Let me tell you, these are so amazing, all you need is some steamed rice on the side and you will be so happy. Only change I would make is add a red bell pepper to the mix next time, I did not have that home and I personally wanted just a bit more veggies, but oh boy did my hubby love it! To make the sauce put all six of the first ingredients into a pot and cook until it starts reducing and thickening, mix cornstarch with a little water and turn it into a paste and add to the sauce. Cook for another few minutes then add to your dish. Leftover sauce keeps for about ten days kept in a jar and refrigerated. Cut the chicken breast in about 2" pieces, do the same with onions, pineapple and red bell pepper if using. 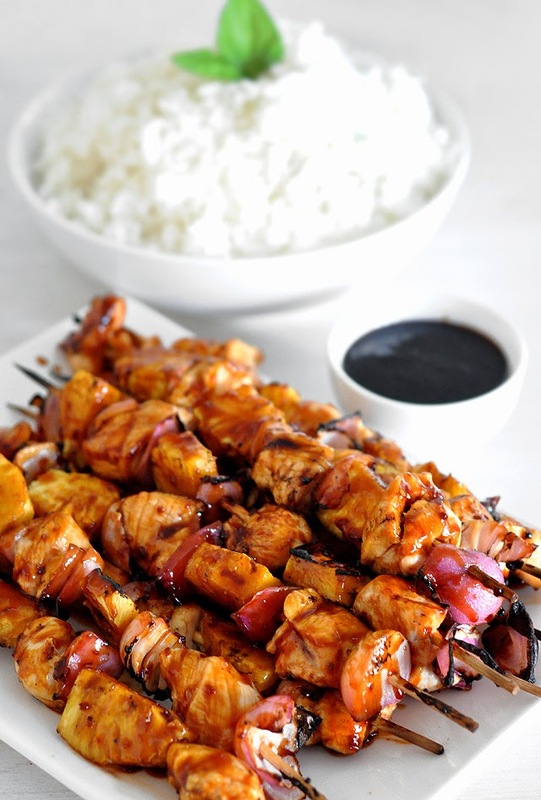 If you are using wooden skewers make sure you put them in water for about 30 minutes so they don't burn on the grill. 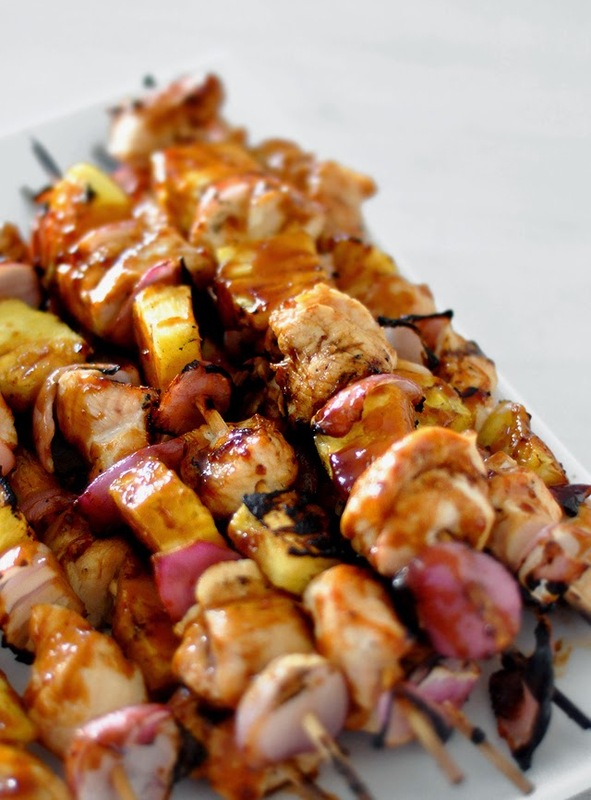 Alternate skewering chicken, onion and pineapple (pepper) until you run out of the ingredients and then grill for five minutes on one side. 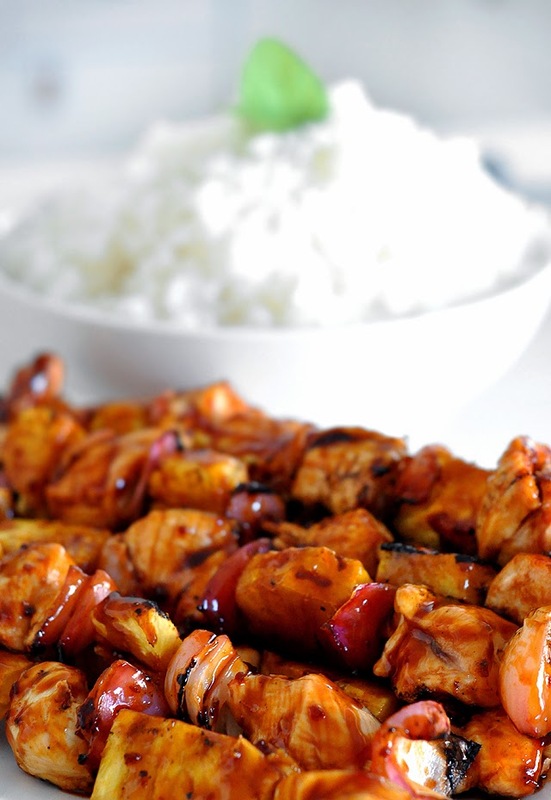 Turn the skewers and start basting with the Teriyaki sauce. Grill until chicken is done and once removed from the heat re-baste the skewers one more time. Serve the leftover sauce on the side, we like to put some on the rice. Enjoy! So incredibly beautiful. I just pinned and can't wait to make this recipe. I like this fruit/chicken combo.Just wish to say thank you for this wonderful recipe.You consistently have the most beautiful chicken recipes.Chicken items are always favorite for me.Visit thesis writing to get more topics.